The other day, as I pulled a tee shirt off a hanger in my closet, I reencountered the 2008 presidential campaign. 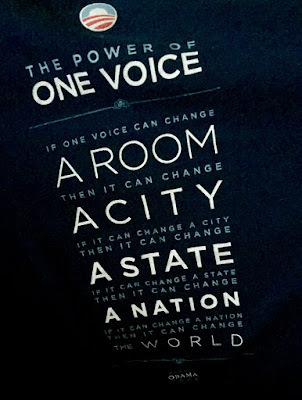 Here's a shot of the tee shirt: "One voice ... can change the world." I was pretty happy about the outcome of that 2008 election, and I was pretty hopeful about what was going to happen after Barack Obama won. Looking back, though, I think the "one voice" message on that tee shirt might have been misleading. I think it kind of let us all off the hook. In a lot of ways, after 2008, we acted as though the "one voice" that had initially changed "a room" was going to be capable of changing "cities," "states," and the "nation," all by itself. A close reading does confirm that the phrasing used on the tee shirt (an official piece of Obama campaign paraphernalia) does suggest that it is the "one voice" that can change not only "a room," but "a city," and "a state," and "a nation" besides. If the "one voice" can do all that, of course, "the world" will be changed by definition. One state can change the nation. Change only BEGINS with an individual, with that "one voice." After that, we all need to be involved, and speak out and take action ourselves. The "next steps" aren't individual, they require collective action. If we think that the "one voice" that we heard at first will be able to do it all, without the rest of us, we are going to be disappointed. We are going to find out that the world wasn't changed nearly as much as we thought it should be, or would be. Waiting around for the "leaders" to take over and make it all happen is not the way to change the world. We are all going to have to work for the changes. Next time around, when we hear that "one voice," let's not make that mistake again. 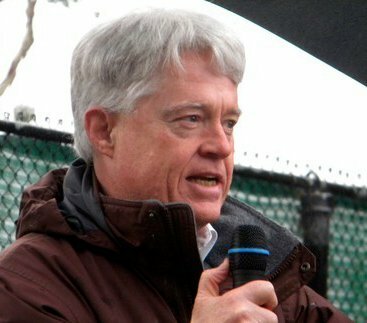 It is my perception that after electing Obama, we all pretty much expected him to "carry the ball," and we acted as if "one" voice was enough to change the world. I think it takes a chorus.